Playing slide guitar can provide new challenges and harmonic possibilities for any guitarist. While many players choose to purchase their slides, others prefer the feel and sound of a homemade guitar slide. While this may sound tricky, with a glass cutter and a wine bottle we can be playing our favorite tunes with a homemade slide in a matter of minutes. Wash out the wine bottle to make sure there is no left-over wine stuck to the glass. Allow the bottle to dry for 15 to 20 minutes. Measure three inches down from the top of the neck of the wine bottle. Use the glass cutter to mark the bottle at the three inch line. Using the glass cutter, score around the neck of the bottle at the three-inch mark created earlier. Make sure to use constant pressure, not too hard, all of the way around the neck. Grip the neck of the bottle in the right hand and firmly knock the body of the bottle against a hard surface. This will cause the neck and body to separate where the groove was made by the glass cutter. Don't worry, the bottle will not shatter, only separate. Polish the cut edge of the bottle neck with the sandpaper. Make sure to remove all edges, as this end will have direct contact with the left-hand ring finger when being played. 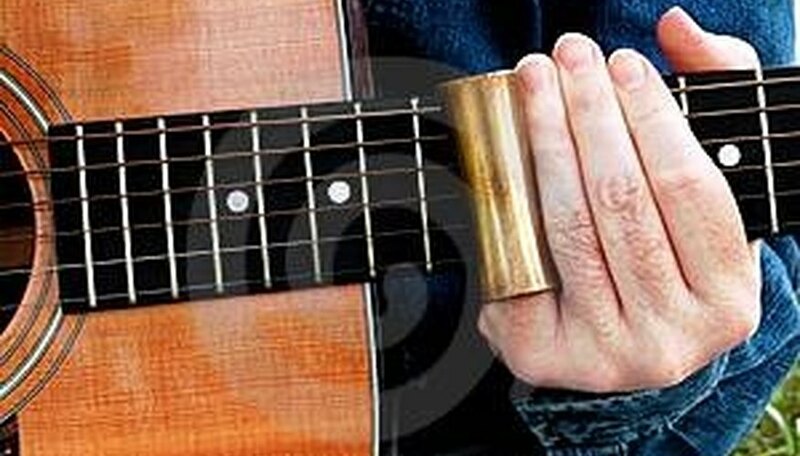 Slide the polished bottle neck over the left-hand ring finger and use it to play slide guitar. Sometimes a small amount of glass will break off when separating the neck from the body. Try laying down a towel or sheet in order to catch any small shards that fall during separation. Wearing latex gloves, thin or thick, can help prevent hands from being scratched, or nicked, during the polishing and separation phases.